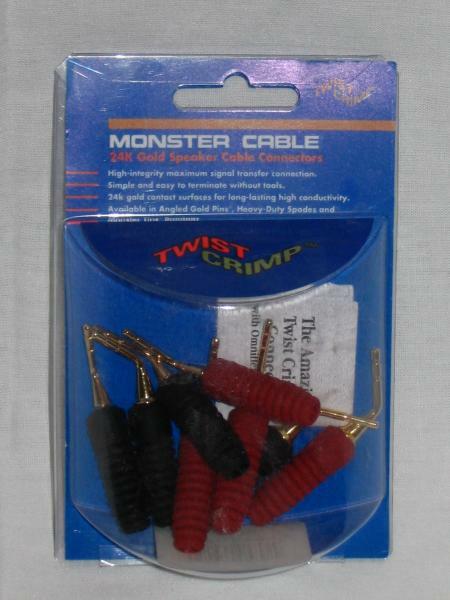 I got these Twist Crimp connectors to terminate (14 ga.) speaker wire in a home stereo application. According to the Monster website, this product will work with "12/14 ga." -- I can't verify that it will work with 12 gauge cable but I don't see why not. It will, of course, work with smaller gauge cable too. These terminators worked well but I no longer have a use for them so I am putting them up for auction. They were installed once and have been sitting unused for well over a year. They look "as new." These are of a crimpless design, and built quite solidly. You can re-use them without any issues or wear. Basically, you "screw" the connector onto the cable. The interior of the terminating connector is threaded inside. It's pretty easy to do, but please note that if you use cable with a slick dielectric insulation sheath inside, you will have to pinch the cable tightly with your fingers so that the cable will not rotate inside its jacket. That's really the only "gotcha." Standard speaker cable or lamp cord will generally be immune to this issue. When done right, the speaker cable will not fall out even under strain and you will have a solid connection. The best thing about a crimpless design is if you mess it up, you can always try again! 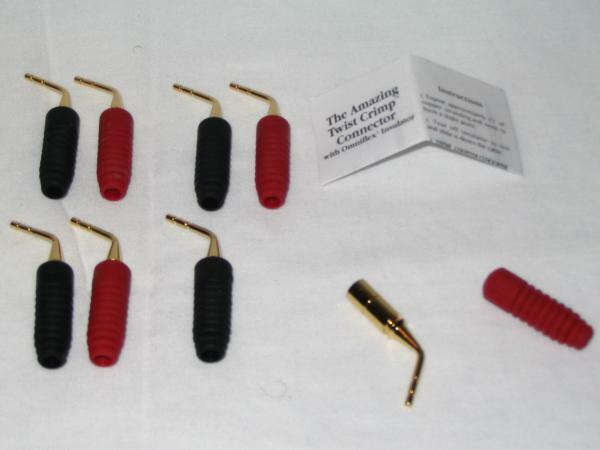 Those who are fans of a clean installation will definitely like these connectors. Please make sure that these narrow diameter pins will work in your application. These are not banana connectors, but they will fit in a multi-combo connector that accepts bananas and bare wire. Basically, this product should work in any female connector that accepts bare speaker wire. $1 starting and NO RESERVE. Current new retail price of this item is $14-15. Shipping will be $1.00 USPS First Class Shipping within the United States ONLY. Shipping insurance is not available for this item. I ship with a delivery confirmation (if applicable to the carrier) and I will email the delivery confirmation/tracking number once the item ships.